Following our trip to Kangaroo Island in 2007 (see other blog), the final leg of our trip Down Under was to fly from Adelaide to Perth for an overnight stay in order to catch the morning flight to Broome where we joined a safari tour of the Gibb River Road from Broome to Kununurra. In Perth we tried an unorthodox housing arrangement through Couchsurfing. I had done a bit of Couchsurfing in the US before this but Lil was a bit skeptical about this notion of staying in a stranger’s house (for nothing). The idea is based on the ‘pay it forward’ concept, that by making use of a stranger’s hospitality, we would reciprocate by opening our house to other travelers. My reason for wanting to try this novel idea was a dissatisfaction with the usual hotel experience where one really does not get to meet any locals except the hotel concierge. I thought for this trip to Perth, we were arriving in the late afternoon and departing in the early morning, so it was unlikely that we would be able to get any feel for the city or its people since we didn’t know anyone. By couchsurfing we would at least meet someone. As it turned out we had a great experience. This was the first couchsurfing experience for Sally, the woman who responded to us. She was doing it because she had plans to go to Europe the following summer and hoped to be able to couchsurf there. So she figured that she needed to build up some positive reviews as a host first. She even picked us up at the airport (something that is not typically done). I have to admit that as we were driving from the airport to her house, it occurred to me that if Sally were up to no good, we might be in some trouble. After all no one really knew where we were or where we were going. Our kids were very skeptical of this idea when I told them where we were staying in Perth. If we disappeared the only way to track us would have been to hack into my couchsurfing account. I had left open the possibility in my mind, that if we didn’t like the looks of the situation we would decline the couchsurfing and find a hotel near the airport. But as soon as we met Sally, I was sure it would work out fine, which it did. We invited her and her boyfriend out for dinner at a local pub and had a great time. Unlike the standard couchsurfing experience where the visitors stay on the extra couch in the livingroom, she gave us her bed in the bedroom. Apparently when she told her mother what she was doing and that the guests were 60 year-olds from the US, her mother said that she couldn’t put us on the livingroom couch, so we got her bedroom. 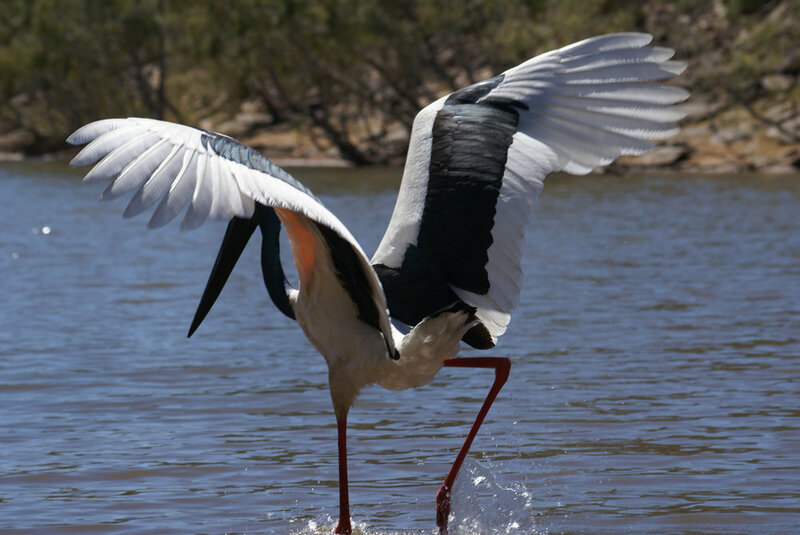 The next morning we flew to Broome for an overnight stay before the safari tour began. Broome is a small community that has the feel of a town 20 years behind the times with a hippie vibe. I booked a hostel there where we shared a room with 6-8 others. This was the weakest of our accommodations as there was a stream of people coming in and out at night. Broome itself though is very cool. There was an open air movie theater where you sit in a courtyard to watch old classic movies. Surprisingly for a town of this small size, it had a few shops that had an Asian influence. Apparently the town was put on the map by pearl divers in the nearby sea, most of whom were from Japan and China. Best of all though was Cable Beach that is famous for its sunsets. The beach is unusual in that the water is very shallow for a long way out so you can wade out quite far. And we were lucky that the sunset was indeed spectacular, especially when a sailboat came by at just the right time. The other iconic picture of Cable Beach is a team of camels carrying tourists out for a sunset ride but we missed that. Usually we have shied away from taking tours, but this seemed like a special case. The Gibb River Road is a classic Aussie wilderness trip through the Kimberleys in the far north. It can only be done in the dry season since during the wet season practically the whole area is under water. You have to do it in a 4WD vehicle since there are numerous rivers to ford. Initially I started out planning to rent a 4WD and doing it following guidelines that are available on line, but my traveling companion wasn’t happy with any of that so we finally decided to go with a tour. The final straw probably was a warning from one traveler that you need to know where to set up camp at night so that the crocodiles aren’t a danger. Basically if you stay in the campgrounds with the other tours, there’s no problem with crocs wandering in. Now that I’ve done it once, I feel confident that we could do it without a guide. The tour group we settled on was perfect for us. All Terrain Safari runs week long tours that go a number of places, including the Broome to Kununurra segment that we chose. They have a more rustic approach to the trip than other tours that we saw. Our tour leader was part aboriginal, so that gave us a special point of view while touring this region which can really be considered aboriginal country. Our Gibb River Road trip. Our tour took the dotted path going west to east. We were picked up to start the tour in Broome though the Gibb River Road doesn’t begin until Derby, about 100 miles further east. There were 10 of us on the tour plus our guide and driver. We rode in a 4WD bus that had bad springs and not much storage room so much of the luggage and supplies had to be tied onto the top of the bus. In Derby we stopped at one of the historic sites in town, the old Boab Prison Tree, a massive Boabab tree with an enlarged hollow trunk, so large that they used it to hold prisoners, usually aborigines. It had an opening on one side that served as a door. To our surprise the sign attached to the tree referenced a friend of ours in UW-Madison, David Baum who we knew studied baobab trees. We made a stop at an aboriginal settlement. One of the interesting aspects of that visit was that we had to leave all of the alcohol, i.e. beer, outside the settlement before we could enter. Alcoholism is such a problem with the aborigines that such laws are required. In many ways the aborigines in Australia face the same problems that the native Americans face in the US. In comparing how the government and society treat the native people, it seems like Australia is doing a better job in trying to integrate them into society and to get the society to accept them. For example, in our many trips to Australia, we have seen many aboriginal shows. Almost all events in Australia, it seems, include an aboriginal component. We loved seeing these shows and always went out of our way to look for them. Musical groups, usually with drums and a didgeridoo, were the usual show. In the US it’s difficult to remember when we last were at an event that included a native American component. The first night we stayed at Windjana Gorge which we explored in the morning. Nearby is Tunnel Creek which is a 750 m tunnel system with crystal clear water running through it which was refreshing to wade in since it was hot outside the tunnel. The extensive cave system reputedly was a place where Jandamarra, a famous aboriginal freedom fighter, used as a hideaway. During the Devonian period this area was an underwater barrier reef when sea levels were higher. The road is a narrow two-lane gravel which in some places was heavily corrugated with a deep and regular ripple pattern, a bit like small moguls on a ski hill. I’m not sure what creates the regular ripple, perhaps an interaction between the resonant frequency of shock absorbers and the speed of the cars? In any case, it made for a bumpy, dusty and noisy ride. As I mentioned above, we chose this tour because it was more DIY and rustic than others. We slept in sleeping bags out on the ground under the vast Aussie sky, helped to cook and prepare all meals, gathered firewood for the fire every night, etc. We saw other tours where they slept in tents and had fancy meals set out for the guests every night. I’m sure they were more expensive, and having everyone pitch in to help lends a nice comraderie to the whole affair. At night we always had a campfire to cook dinner and also to keep warm as the evenings were cool in the Australian tropical winter. . The night sky in the Kimberleys is quite impressive since there are no cities or houses to provide light pollution and the skies are clear. The only light is from campfires. Our guide pointed out a number of creatures in the night sky that were worshipped by the aborigines. Interestingly, the creatures were created by the absence of stars, i.e. the dark spots in the dense array of stars visible in the carpet of lights. The countryside is largely deserted except for many boab and gum (eucalytus) trees and an occasional small settlement along the road to provide fuel and supplies. There are some ranches too, as occasionally there are cows in the road. There are few inhabitants and many of those are aborigines. which makes sense since this is their country. Packing the essentials: a case of Toohey’s lager. At one point the original van developed some kind of engine trouble so they called in a back up van which required transferring all of the luggage and supplies to the new vehicle. There are quite a few river crossings on the road, which are always exciting. Most of the rivers are relatively small so the crossings are short, but it is often difficult to see just how deep the water is. Obviously some experience in driving the road is important in the river crossings, which is why going with a tour makes sense. At one of our campsites we took a night walk along the river and shining a bright flashlight along the shore revealed many pairs of red lights looking back at us from the crocodiles waiting for a night snack. This just emphasized the importance of not getting stuck in the middle of the river. At one of the river crossings where our guide knew the river bed was shallow and flat, he invited us to get out to get a picture of the crossing from the outside. To make a dramatic picture he gunned the motor and sped across the river with a big splash. Most of the other sights along the trail involved water holes of one kind or another. Since the days were hot, the swimming holes provided a refreshing respite. Galven’s gorge was a particularly scenic stop with a boabab tree guarding the top and a well used vine for swinging out over the water. To get to Manning Gorge, one had to wade a small river which was deep enough that you had to swim for part of the crossing. To accommodate travelers, they provided styrofoam containers for keep things dry during the swim. Our group had a problem that one of our cohorts said he could swim but was nervous about doing it. So I volunteered to help him if he needed it. Well, when his feet no longer hit bottom, he grabbed the styrofoam container, thereby sinking it and its contents, which included my DSLR camera, which did not survive the dunking. There were also several outstanding waterfalls, including the big and small Merten’s falls. and culminating in the spectacular Mitchell Falls in the far north of Kimberley. The area does not have much wildlife but we were lucky to see some brolgas and jabirus. But the other interesting sites were aboriginal art on the rocks and caves all along the road. Since our guide was part aborigine, he was quite familiar with its origins and history. In one case there was some art that was only supposed to be seen by females which we respected, of course. In general the art is not protected in any way but it has survived for many centuries with little signs of graffiti. 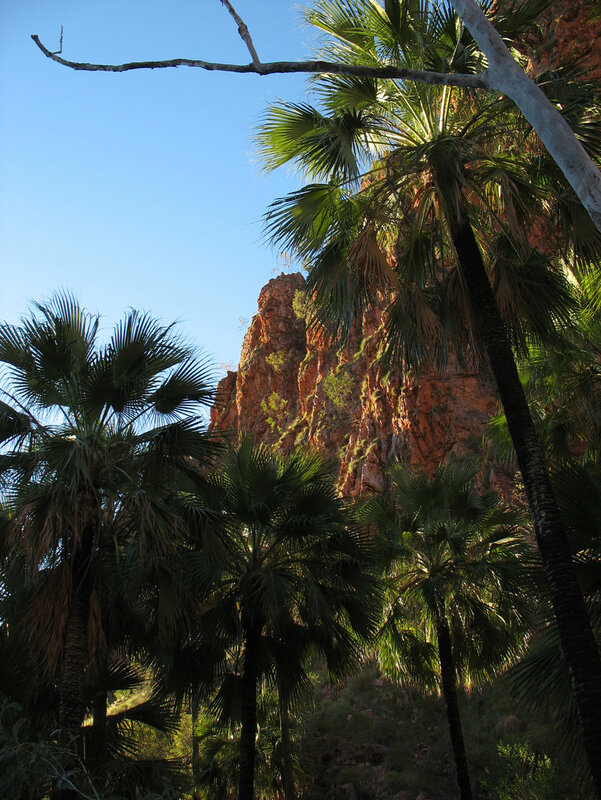 The last stop on the tour was at a large ranch El Questro Station. There was a lot of excitement there since apparently they were filming the film Australia with Nicole Kidman there. She was or had stayed on the ranch. We did not stay there but we managed to make use of a hot thermal spring on the ranch for a pleasant dip. We also drove out to a lookout known as Branco’s lookout for a scenic view of the countryside at sunset. We then drove the final bit to Kununurra where we bid adieu to the rest of the crew. Some of them were continuing on to the rest of the tour which was a return trip to Broome but driving south of the Gibb River Road through the Bungle Bungles. We didn’t have time for that leg and were headed for Darwin for the flight back to the US. All in all it was a very memorable trip.